SCA is exposed to a number of risks that could exert a greater or lesser material impact on the Group. These risks are generally defined as factors that impact SCA’s ability to achieve established targets for the Group. This applies to both financial targets and targets in other areas. SCA’s targets are outlined in chapter Objectives. Many of the risks described could have a positive or negative impact on the Group. This implies that if a risk develops in a favorable manner or if risk management is successful in counteracting the risk, target fulfillment could exceed expectations. From this perspective, the risks could also entail opportunities for SCA. Examples include the GDP trend and the economic situation, the cost of input goods, customer and consumer patterns and movements in market prices. The description in this section relates to the structure that the SCA Group had at year-end 2016. SCA’s structure and geographically dispersed business entails in itself a certain degree of risk reduction. SCA conducts operations in three business areas that deliver to entirely or partially different customer segments and end-users. The operations are influenced to varying degrees by the business cycle and general economic prosperity and their competitive situations also differ. SCA’s products are sold through many different channels and distribution paths. The operation has a large geographical spread. Sales are conducted in approximately 100 countries worldwide and manufacturing is pursued at about 100 production units in some 30 countries. Sales are often based on local manufacturing. SCA’s structure also ensures that the raw material flows are, to a certain degree, integrated from forest land to the finished consumer products. In 2016, 48% of SCA’s wood raw material requirements were sourced from its own forests and chips from its own sawmills. The wood fiber is used for SCA’s production of pulp, kraftliner and publication papers, in sawmill operations, and for the manufacture of tissue. Forest waste from SCA’s activities is used in biofuel operations. The energy generated in the production process is used internally or sold. The pulp is subsequently used mainly in the production of tissue. In 2016, own pulp production corresponded to 23% of SCA’s pulp consumption. SCA’s Board determines the Group’s strategic direction based on recommendations from the Executive Management Team. The responsibility for long-term and overall management of strategic risks follows the company’s delegation scheme, from the Board to the President, and from the President to the Business Unit Presidents. This implies that most operational risks are managed by SCA’s business units at a local level, but are coordinated when deemed necessary. The tools for this work primarily comprise continuous reporting by the business units and the annual strategy process, which includes risk assessment and risk management as part of the process. In this process, identified risks have been classified according to the likelihood of the risk becoming a reality and the impact on SCA’s goal fulfillment. The outcome of this evaluation constitutes a part of the assessment of risks described in this section. SCA’s financial risk management is centralized, as is the case for the corporate internal bank for financial transactions of Group companies and management of the Group’s energy risks. The financial risks are managed in accordance with the Group’s finance policy, which is set by SCA’s Board and, together with SCA’s energy risk policy, comprises a framework for management activities. The risks are grouped and followed up on a regular basis to ensure compliance with these guidelines. SCA has also centralized the management of other risks. SCA has established a corporate internal audit unit, which ensures that SCA’s organization complies with the set policies. SCA’s volume development is linked to the development of GDP and related factors, including industrial production, in countries representing SCA’s main markets. Movements in the GDP trend influence demand for some of SCA’s products, primarily in the Forest Products business area. 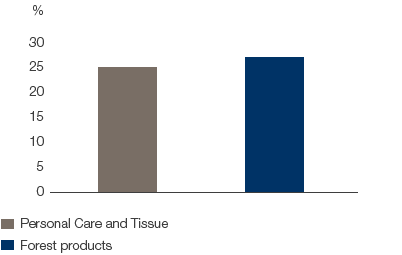 In 2016, Personal Care and Tissue accounted for 86% of SCA’s net sales. Sales to the retail market, which accounts for the bulk of sales of hygiene products, are more dependent on established consumption patterns and distribution than the economic climate. The institutional care and homecare facilities segment for incontinence products is also relatively unaffected by the business cycle, although it can be impacted by the public budget situation in certain countries. The segment in the hygiene business that is most sensitive to economic movements is AfH tissue, which is affected by the consumption of tissue outside the home, for example, within industry and offices, as well as in the hotel and restaurant industry. Forest products are vulnerable to economic movements. 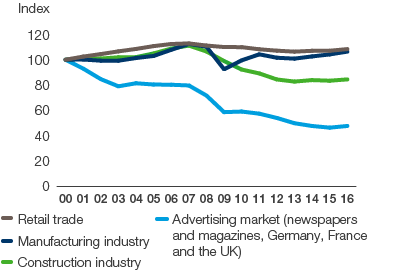 Sales of publication papers, representing 3% of SCA’s net sales, are affected by fluctuations in business activity in the advertising sector, and future demand could be adversely impacted by lower readership of printed media. The relatively cyclical construction and prefab house industries impact SCA’s solid-wood product business, which accounts for 5% of net sales. SCA’s kraftliner is primarily used in packaging where strength plays an important role. Sales of kraftliner, which account for 3% of SCA’s net sales, are impacted by developments in the manufacturing industry and retail sector as well as by goods deliveries based on growing e-commerce. For all businesses, it is important that SCA manages the effects of the economic movements that occur by taking actions to reduce costs and by reviewing the capacity and production structure. SCA’s operations have an impact on air, water, land and biological processes. These effects could lead to costs for restoring the environment or other kinds of negative effects. The matter of the economic impact of climate change is also growing in significance. A number of years ago, SCA established a sustainability policy, detailing guidelines for the Group’s actions in the areas of environmental and social responsibility. In addition to this, targets for people and nature are an integrated part of SCA’s business strategy. Risks are minimized through preventive work in the form of certified environmental management systems, environmental risk inspections in conjunction with acquisitions, and remediation projects in connection with plant closures. The Group’s large forest holding has a significant positive environmental effect through the absorption of carbon dioxide. The forest also guarantees access to renewable forest raw materials and provides valuable ecosystem services for society. Through its Resource Management System (RMS), SCA monitors how the company utilizes energy, water, transport activities and raw materials. The data is used for internal control and follow-up of established targets. SCA works proactively to decrease its carbon footprint by reducing its energy consumption and emissions of greenhouse gases. Continuous efforts are conducted to increase the proportion of renewable energy and biofuel, such as wind power. SCA also works to reduce the volume of production waste. A comprehensive description of SCA’s work and governance in this area is provided in the Group’s Sustainability Report. SCA is affected by political decisions and administrative regulations in the approximately 100 countries in which the Group conducts operations. These relate to general regulations, such as taxation and financial reporting. SCA is also impacted by more specific regulations, such as the granting of permits in accordance with the Environmental Code and reimbursement of expenses in the healthcare system. SCA’s Public Affairs unit works to monitor and evaluate changes in its surroundings and amended legislation, and to identify actions that lead to improvements of the policy areas/regulations for the benefit of SCA’s stakeholder groups. SCA is also a member of national and international trade associations, which comprise the primary bodies for participation in current public debates and the improvement of relevant policy areas. A key area for SCA is global energy and environmental legislation. Since SCA has a large share of its operations in Europe, it is focusing its activities on the various EU institutions. SCA monitors developments in prioritized policy areas, such as resource consumption in general and, more specifically, issues relating to waste and emissions to water and air. This makes it particularly important to monitor EU emission rights trading and EU waste regulations and circular economy initiatives. Since the public sector is both a significant customer and stakeholder group for SCA, the health debate is important to the company, especially with regard to the development of systems for healthcare with greater patient benefit and greater cost efficiency. SCA also works actively to disseminate knowledge and solutions regarding various national systems to decision-makers in countries where new structures are being built up. Examples include the development of systems for cost-free or subsidized prescription of incontinence aids in countries where such benefits were not offered in the past. Other product solutions (substitutes) can replace products that are included in SCA’s offering and thereby reduce sales. By offering competitive products, SCA can also capture market shares from the substitute. The issue of substitutes is also linked to changes in the patterns and attitudes of customers and consumers that affect demand for certain products and thus profitability. Substitutes exist for virtually all SCA products. This may involve different products with a similar function, such as cloth diapers or cloth rags for household or industrial cleaning, or completely different solutions to meet the needs of customers and consumers, such as electric hand dryers and the dissemination of news through digital media instead of paper. SCA’s focus on customer and consumer insight guides its innovation activities, ensuring that new products and services provide competitiveness and that the company’s offering continuously evolves to meet customer and consumer needs. New technological solutions are developed through the company’s own research and development activities and in cooperation with suppliers. Development work is thus often conducted in direct cooperation with customers and suppliers of material and machinery to provide a direct link to requirements and feedback from customers, at the same time as more efficient processes and products are developed. An increasingly important factor is greater focus on sustainability with respect to environmental, economic and social factors. Other demands imposed on SCA’s innovation include the desire to create profitable differentiation for SCA’s product offering and create value and growth, both for customers and SCA (read more about innovation in chapter Innovate bigger brands). In many countries, the degree of penetration is low, meaning only a small proportion of the population uses SCA’s products, compared with more developed countries. To increase acceptance of its products, SCA focuses on matters that influence attitudes and on breaking taboos. This also applies to Europe and North America with regard to such items as incontinence products. The retail trade is SCA’s single largest customer group and thus exercises considerable influence. Around 55% of SCA’s net sales are made to the retail trade, under both SCA’s brands and the retailer’s own brands. SCA also uses other distributors or retailers, which could impact the Group. A general consolidation process is taking place in several of SCA’s sales channels, thus increasing dependence on individual customers. This increase in dependence could result in negative consequences if SCA does not fulfill the demands imposed. SCA’s customer structure is relatively dispersed, with customers in many different areas of business. In the retail trade, the prevailing trend is towards increased concentration, which has mainly resulted in fewer retail companies at a national and regional level. This could also present opportunities through closer cooperation. There are still a considerable number of retail companies, which reduces the risk for SCA. SCA also uses distributors, mainly for AfH tissue. A very large number of distributors are active in this segment and the international concentration is relatively low. In 2016, SCA’s ten largest customers accounted for 23% of SCA’s net sales. The single largest customer accounted for 3% of net sales. Most of these customers were retail companies. The ten largest customers also include some large distributors of AfH tissue. Credit risk in accounts receivable is dealt with in the section Credit risk below. Movements in the market price of SCA’s products could create major fluctuations in the profitability of the product in question when these movements are not linked to changes in costs for SCA. Several methods can be applied to address this risk. Long-term contracts at fixed prices and price hedging only occur in exceptional cases. To reduce the impact of price movements on SCA, actions are taken to adapt the cost scenario to lower market prices, for example, by renegotiating purchasing agreements, implementing personnel and capacity reductions, and reviewing the business structure. In other cases, the product’s content can be adapted to the new market price level. 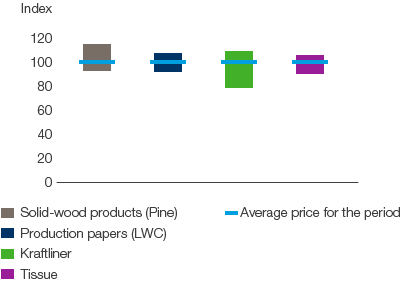 Movements in the market price in a number of SCA’s product segments are detailed in the figure to the right. The diagram specifies the average price per year (Index 100) and movements around this value over the past ten years. SCA has around 100 production facilities in some 30 countries. Many of them conduct continuous production. Fires, machinery breakdowns and other types of harmful incidents could damage the plant in question and also cause delivery problems. SCA’s activities in this area are governed by its Risk Management Policy, which controls how SCA shall manage insurable operating risks. From this perspective, the aim of risk management is to effectively and cost efficiently protect the employees, the environment, the company’s assets and the business, and to minimize SCA’s risk management costs. This can be achieved by creating and retaining a balance between loss prevention and insurance coverage. The loss-prevention work is conducted in accordance with established guidelines that include inspections by risk engineers and benchmarking with other plants, within and outside SCA. Other important elements of loss-prevention activities include maintenance of plants, staff training, good orderliness, and documentation. Every year, SCA invests in loss-prevention measures and its production plants continuously work to reduce their risks. For example, new facilities are fitted with sprinkler systems as standard. All wholly owned plants are insured to replacement cost and for the loss of contribution margin. Within the EU, insurance is primarily carried out by one of SCA’s own companies, with external reinsurance for major damages. Outside the EU, SCA cooperates with market-leading insurance companies. SCA works in some 100 countries and in environments where unethical business practices and violations of human rights may occur. If SCA becomes involved in these business practices, the company’s reputation in the market may be damaged. SCA may also suffer fines and other legal sanctions. SCA works together with various business partners, such as customers, distributors, partners in joint ventures, suppliers and others. Differences in culture and ways of working between SCA and these partners can increase the risk mainly with regard to business ethics and consideration of human rights. To ensure that SCA’s organization lives up to the company’s core values and is not drawn into or tied to unethical business practices, the SCA Code of Conduct has been established since 2004. This includes rules for how the company conducts its business. The Code is revised on an annual basis to ensure that new laws and guidelines are taken into account. The Code includes principles on business ethics, relationships with the employees, respect for human rights and the environment, and other areas. SCA’s Group policies, including its Code of Conduct and Sustainability Policy, must apply to all markets in which SCA conducts operations. Training of all of SCA’s employees regarding the Code of Conduct takes place continuously. To ensure that SCA works with business partners that share these values, potential partners are evaluated before cooperation is initiated. The evaluation comprises both business issues and issues concerning existing policies and processes regarding, for example, the work environment and business ethics. Suppliers are expected to comply with SCA’s Code of Conduct, which is regulated as a part of the supplier agreements. SCA uses a number of methods to monitor and safeguard the implementation of the Code of Conduct. These include due diligence in connection with acquisitions, risk evaluation of the company’s own units and its suppliers, and regular on-site audits of SCA’s units around the world and of suppliers deemed to have a higher risk level. More detailed information on the Code of Conduct and the work in 2016 is available in the Group’s Sustainability Report. SCA is dependent on a large number of suppliers. The loss of key suppliers could result in costs for SCA and problems in manufacturing. Suppliers could also cause problems for SCA through non-compliance with applicable legislation and regulations or by otherwise acting in an unethical manner. To reduce this risk, SCA has supply contracts with several suppliers and continuously enters into agreements with various durations. The Group has a number of suppliers for essentially all important input goods. These contracts ensure deliveries of a significant proportion of input goods at the same time as the effects of sudden cost increases are limited. The Group also has more intensive cooperation with selected suppliers that covers the development of materials and processes. More information is available in SCA’s Sustainability Report 2016. The market price of many of the input goods used in the manufacture of SCA’s products fluctuates over time and this could influence SCA’s earnings. The risk of price movements related to input goods and the impact of these on earnings can be managed in several ways. As a result of SCA’s structure, a significant share of raw materials is produced within the Group and, consequently, price movements have a smaller impact on earnings. In 2016, 48% of SCA’s wood raw material requirements were sourced from its own forests and chips from its own sawmills, and 23% of its pulp requirements were satisfied by the Group’s own pulp production. Another method used to manage the price risk is by availing of financial hedges and long-term contracts. SCA is an energy-intensive company and hedges the energy price risk for electricity and natural gas. More detailed information on the energy price risk and management activities related to this is presented below. Under normal circumstances, no other price risks related to input goods are hedged, although this could be carried out in exceptional cases. SCA has also begun building up its own energy operations based on the utilization of the Group’s own holdings of forest land. More information on these operations is provided in the Group’s Sustainability Report. A significant cost item comprises oil-based materials and other oil-related costs, such as transportation. The oil-based materials are principally used in Personal Care and generally as packaging material. When possible, these and other costs are managed principally through compensation in the form of raised prices for SCA’s products, by adjusting product specifications or through streamlining of the Group’s own operation. The impact of price movements on input goods can be delayed through purchasing agreements. SCA’s relative costs for various key input goods are described in chapter Description of costs. The price trend for a number of input goods over the past ten years is presented in the diagram to the left. SCA must have access to skilled and motivated employees and safeguard the availability of competent managers to achieve established strategic and operational objectives. SCA works in a structured manner to ensure the health and well-being of its employees through proactive preventative healthcare activities, such as education, exercise, special initiatives, for example, to help employees quit smoking and by offering health checks in several countries. SCA also places great importance on safety activities at all of its units. More information is available in SCA’s Sustainability Report for 2016. SCA’s strategic manpower planning secures access to people with the right expertise at the right time. Recruitment can take place both externally and internally, and internal recruitment and job rotation are facilitated by a job portal, where available positions are advertised both internally and externally. Salaries and other conditions are to be adapted to the market and linked to SCA’s business priorities. An established succession planning program protects the operations. SCA strives to maintain good relationships with union organizations. New legislation in various countries could negatively impact SCA. Legal processes can be protracted and costly. SCA monitors the development of legislation through its internal corporate legal staff and external advisors. Another important issue is the management of SCA’s intellectual property rights (patents, trademarks, etc. ), which is largely centralized. In the approximately 100 countries in which SCA conducts operations, local legal issues and disputes are handled through an extensive network of local legal advisors. SCA relies on IT systems in its day-to-day operations. Disruptions or faults in critical systems have a direct impact on production and important business processes. Errors in the handling of financial systems can affect the company’s reporting of results. These risks grow in an increasingly technically complex and interlinked world. SCA has established a management model for IT that includes governance, standardized IT processes and an organization for information security. The IT security work includes a continuous risk assessment, the introduction of preventive measures and use of security technologies. Standardized processes are in place for the implementation of new systems, changes to existing systems and daily operations. The majority of SCA’s system landscape is based on well-proven products, such as SAP. Energy price risk is the risk that increased energy prices could adversely impact SCA’s operating profit. SCA is exposed to price movements of electricity and natural gas, but the price of other energy commodities also directly and indirectly impacts SCA’s operating profit. SCA centrally manages the energy price risk related to electricity and natural gas. According to SCA’s policy, these price risks can be hedged for a period of up to 36 months. Energy price hedging is effected through financial instruments and fixed pricing in existing supply agreements. SCA safeguards the supply of electricity and natural gas through centrally negotiated supply agreements. The portfolio of supply agreements shall be effectively spread to minimize SCA’s counterparty risk. In 2016, SCA purchased about 7 TWh (8; 7) of electricity and about 8 TWh (8; 8) of natural gas. 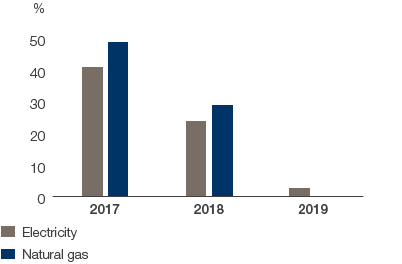 The graph displays SCA’s price hedges in relation to forecast consumption of electricity and natural gas for the next three years. The graph includes financial hedges and hedging effected via supply agreements. Forest Products’ electricity consumption is primarily confined to Sweden. For further information concerning financial price hedges, see Note E6 Derivatives and hedge accounting. Transaction exposure is the risk that exchange rate movements in export revenues and import expenses could negatively impact the Group’s operating profit and the cost of non-current assets. Translation exposure is the risk to which SCA is exposed when translating foreign subsidiaries’ balance sheets and income statements to SEK. The table below presents a breakdown of the Group’s net sales and operating expenses by currency, which provides an overview of the Group’s long-term currency sensitivity. The largest exposures are denominated in EUR, USD and GBP. The imbalance between sales and expenses in SEK is because the Swedish operations have a high proportion of exports that are invoiced in foreign currencies. Operating profit, excluding items affecting comparability. Transaction exposure, resulting from exports and imports, can be hedged for a period of up to 18 months. Contracted future payments for non-current assets in foreign currencies can be hedged up to the full cost. The forecast net flow of currency against SEK amounts to SEK –10,535m (–10,844; –9,856). 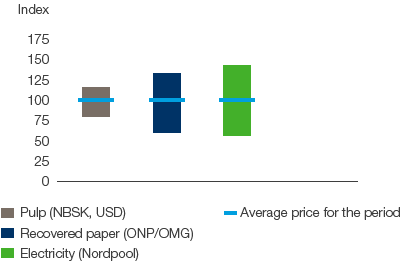 At year-end, a net flow against SEK corresponding to five months of the forecast flow for 2017 was hedged. The majority of hedges mature during the first quarter of 2017. The forecast and hedges of the 2017 flows are shown in the table to the right. Forest Products’ net exports primarily comprise exports from Sweden and is thus exposed to the development of the SEK. For further information relating to hedging of transaction exposure, see Note E6 Derivatives and hedge accounting. The policy relating to translation exposure for foreign net assets is to hedge a sufficient proportion in relation to SEK so that the Group’s debt/equity ratio is unaffected by exchange rate movements. Hedging takes place by financing a certain portion of capital employed in foreign currencies with loans and derivatives in corresponding currencies. The optimal degree of matching in connection with hedging depends on the current consolidated debt/equity ratio. Translation exposure in the income statements of foreign subsidiaries is not currency-hedged. At December 31, 2016, capital employed in foreign currency amounted to SEK 75,219m (65,705; 72,482). Distribution by currency is shown in the table to the right. At year-end, capital employed was financed in the amount of SEK 19,273m (16,898; 18,489) in foreign currency, which is equivalent to a total matching ratio of 28% (28; 26). Forest Products conducts the most of its operations in Sweden, resulting in a limited translation exposure. For further information relating to hedging of translation exposure, see Note E6 Derivatives and hedge accounting. Credit risk refers to the risk of losses due to a failure to meet payment obligations by SCA’s counterparties in financial agreements or by customers. Credit risk in accounts receivable is managed through credit checks of customers using credit rating companies. The credit limit is set and regularly monitored. Accounts receivable are recognized at the amount that is expected to be paid based on an individual assessment of each customer. The objective is that counterparties must have a minimum credit rating of A– from at least two of the rating institutes Moody’s, Fitch and Standard & Poor’s. SCA strives to enter into agreements that allow net calculation of receivables and liabilities. Credit exposure in derivative instruments is calculated as the market value of the instrument. At year-end, the total credit exposure was SEK 8,666m (9,152; 11,313). This exposure also includes credit risk for financial investments in the amount of SEK 7,695m (8,393; 9,985), of which SEK 3,214m (3,309; 6,034) was attributable to leasing transactions (see Note G3 Contingent liabilities and pledged assets). Credit exposure in derivative instruments amounted to SEK 971m (759; 1,327) at December 31, 2016. Liquidity and refinancing risk is the risk that SCA is unable to meet its payment obligations as a result of insufficient liquidity or difficulty in raising new loans. To ensure good access to loan financing, regardless of the economy and at attractive terms, SCA strives to maintain a solid investment grade rating. SCA is to maintain financial flexibility in the form of a liquidity reserve consisting of cash and cash equivalents and unutilized credit facilities totaling at least 10% of the Group’s forecast annual sales. SCA limits its refinancing risk by having a good distribution in the maturity profile of its gross debt. The gross debt must have an average maturity in excess of three years, considering unutilized credit facilities that are not liquidity reserves. Surplus liquidity should primarily be used to amortize external liabilities. SCA’s policy is to not agree to terms that entitle the lender to withdraw loans or adjust interest rates as a direct consequence of movements in SCA’s financial key figures or credit rating. The Group’s financing is mainly secured by bank loans, bond issues and through issuance of commercial papers. The refinancing risk in short-term borrowing is limited through long-term credit facilities from bank syndicates and individual banks with favorable creditworthiness. SCA’s net debt increased by SEK 5,883m in 2016. At year-end, the average maturity of gross debt was 3.9 years (3.4; 2.5). If short-term loans were replaced with drawings under long-term unutilized credit facilities, the maturity would amount to 4.4 years. Unutilized credit facilities amounted to SEK 19,164m at year-end. In addition, cash and cash equivalents totaled SEK 4,482m. For further information, see Note E2 Financial assets, cash and cash equivalents, and Note E4 Financial liabilities. Interest rate risk relates to the risk that movements in the interest rates could have a negative impact on SCA. SCA is affected by interest rate movements through its net financial income and expense. SCA seeks to achieve a good spread of its interest maturity dates to avoid large volumes of renewals occurring at the same time. SCA’s policy is to raise loans with floating rates, since it is SCA’s understanding that this leads to lower interest expense over time. The interest rate risk and interest period are measured by currency and the average interest term shall be within the interval 3-36 months. SCA’s net financial items decreased in 2016 as a result of lower interest rates and positive currency remeasurement effects. 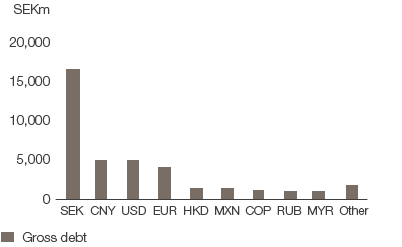 SCA’s largest funding currencies are denominated in SEK, CNY and USD, refer to the graph. To achieve the desired fixed interest period and currency balance, SCA uses financial derivatives. The average interest period for the gross debt, including derivatives, was 8.5 months (9.3; 8.4) at year-end. The average interest rate for the total outstanding net debt including derivatives, amounted to 2.69% (2.90; 2.64) at year-end.